Omelettes are one of my most favorite things to cook. Fluffy, delicious, and simple to make. There are so many options when making omelettes, whether you make the classic style omelette, rolled omelettes, or a folded omelette. Then you need to decide on the fillings you want. I know ham and cheese are popular, but I just love a cheesy southern-style Omelette filled with peppers, onions, tomatoes, and of course lots of cheese. The final thing you need to make your Omelette perfect is the best Omelette pan you can find. I have a few options when it comes down to that! 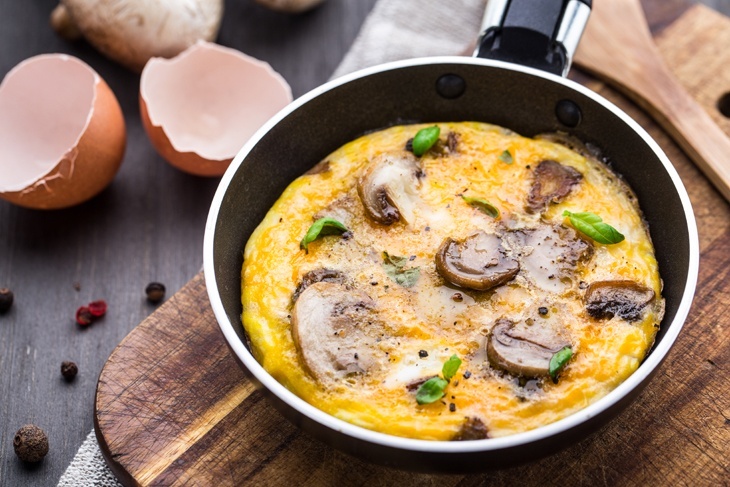 Omelette pans can come in a variety of sizes, colors, and shapes. 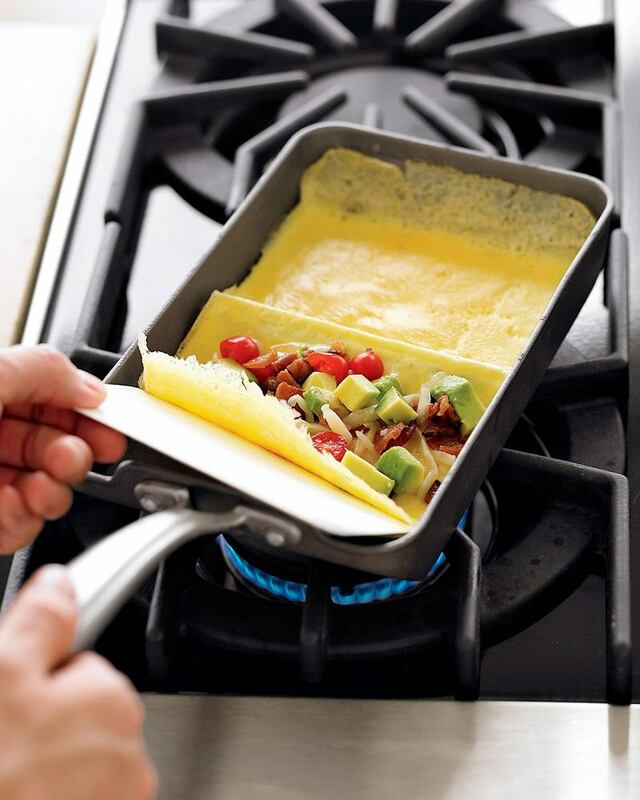 You can find omelette pans in the shape of squares, rectangles and circles, and in sizes that range from 4” to 10”. Most omelette pans are a shallow skillet that has sloping sides. This allows for easy flipping. 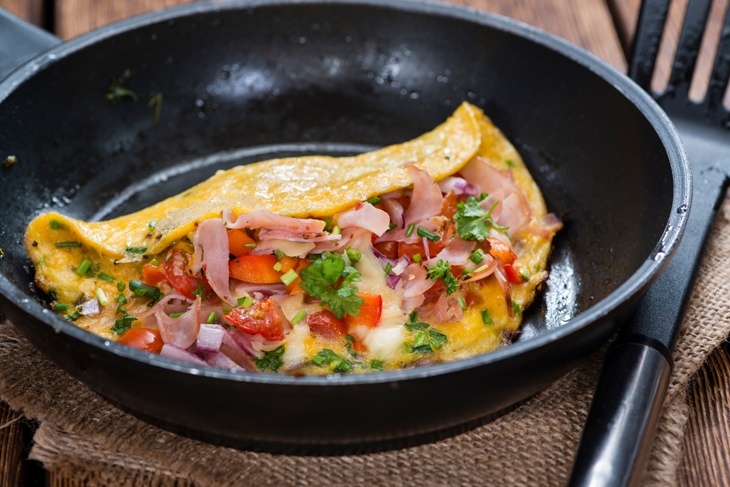 Omelettes are a popular breakfast meal to start your day with. From fancy crepe-style omelettes filled with cheese and spinach to Omurice in Japanese culture that features rice covered by a delicious runny omelette. The best way to cook an omelette is by using an omelette pan; they are designed to make omelettes easier and cook thoroughly. They feature nonstick surfaces and give you a guideline on rolling or flipping your omelette. When buying an omelette pan, you should check to make sure that the surface is non-stick. This will keep the omelette from sticking to the pan and ripping. I tend to look for non-stick or ceramic style pans to make my omelettes in. I also like a variety of shapes, but the round omelette pans are the easiest to use, especially for beginners. I have a stockpile of about eight different omelette pans. I have a rectangle omelette pan, a square pan, and lots of different sized round pans for omelettes. The reason for this is the size of the omelette and the thickness. If you aren’t very hungry and only want a single serving omelette, then you wouldn’t want to use a 10” pan. It’s too big and wouldn’t give you a very good omelette. 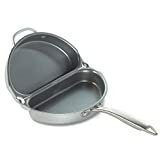 The pan sizes come in handy for the size of your desired Omelette and for who you are cooking for. Even when using a non-stick or ceramic pan, you should still always butter, or spray, the pan. After buttering the pan, proceed to heat the pan to sizzling. When you put the egg(s) into the pan, they should begin to cook immediately on the bottom. When you are ready to flip the Omelette, make sure to carefully guide the egg to the edge of the pan before giving a tight jerk to flip half the egg over the other half. Resume cooking until finished. If you are using a rectangle or square pan, guide the egg to the edge of the pan, and using a spatula, flip the egg over into thirds. Continue cooking as desired. 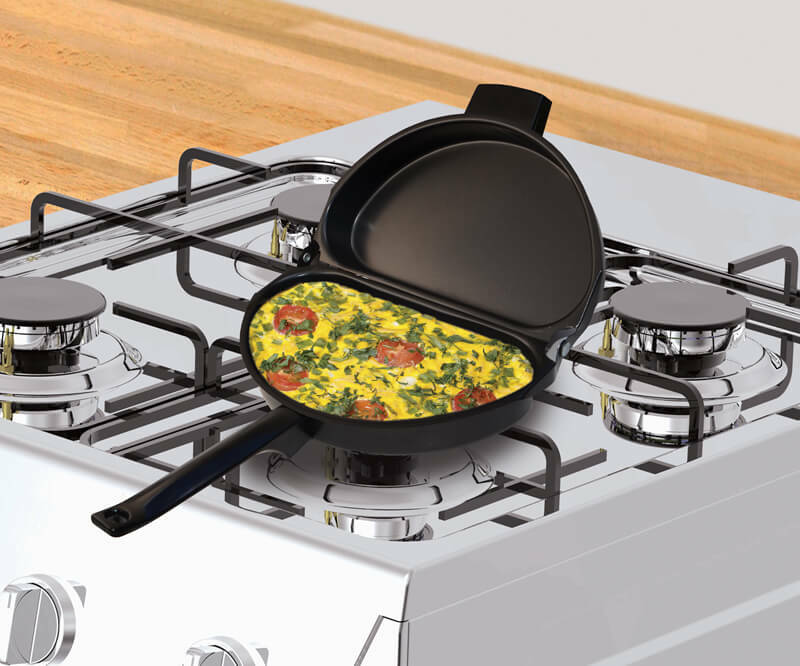 Omelette pans are designed to make Omelette cooking easier. They are usually ceramic or coated to prevent sticking. Many cultures cook Omelettes in unique ways, so there are many shapes, styles, and designs you can acquire. 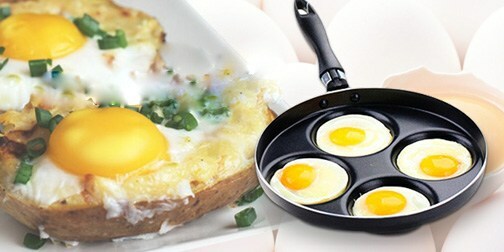 From half style pans that fold and will flip your egg without any mess to rectangle pans to make rolled Omelettes. These pans are designed to make Omelettes less messy and easier for beginners and experts. You can use an Omelette pan for other cooking. However, it could wear off the non-stick coating faster, or scratch up your ceramic. Many cooks will dedicate their Omelette pans strictly for Omelettes. When you want to season your Omelette pan, coat the pan with oil, heat it on the stove, and pour salt into the pan. When the salt turns a greyish-brown, remove from heat. Discard the salt. Wipe dry. To clean your Omelette pan, take a damp paper towel and wipe the pan thoroughly. Wipe dry. Put away. You should not put your pans in the dishwasher as it can remove the coating and scratch the pans. Omelette pans have many uses and can be used for other cooking if you wanted them to be. Owning Omelette pans can have great advantages for the chef of the family. However, these advantages also balance out by the disadvantages they provide. Some advantages of owning Omelette pans are that they make Omelette cooking easier and less messy. These have a non-stick coating, so the Omelettes will flip easier and won’t rip. Many different sizes and shapes offer for unique experimenting with Omelettes to find your favorite style. The disadvantages of owning these pans are that you may only feel comfortable cooking in your Omelette pans. You may not feel as confident in using regular cookware. Cleaning and seasoning the pans may not be something you are used to doing and might require special attention. Having multiple Omelette pans can also clutter your area, leaving you with little space for other kitchen gadgets. I went through all the pans I could find for Omelettes, and you would be surprised to see what I had to narrow down to. Omelette pans are a wonderful thing to have on hand. 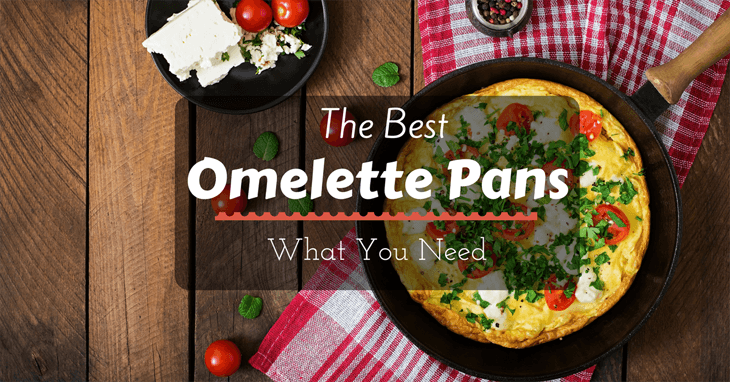 I narrowed my search down to the top 5 best Omelette pans I could find for you and your kitchen. I hope you can find your favorite from my list. Calphalon Unison Nonstick 8-Inch and 10-Inch Omelette Pan Set is a two-piece Omelette pan set. The pans are ultra-smooth and coated twice for non-stick. With this design, you do not have to use butter or a cooking spray. 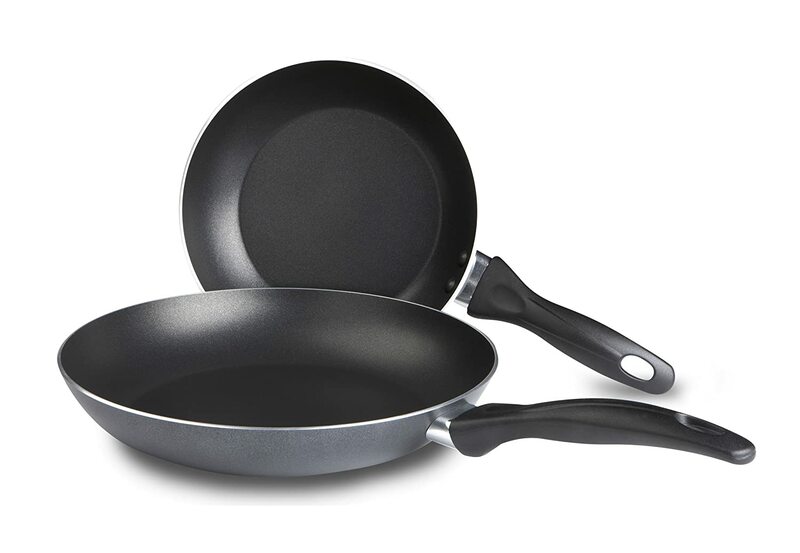 The Omelette pans have long handles that are riveted to the pan securely to make for a durable and long-lasting pan. The handles will even stay cool while you are cooking at high heat. They are flat and wide and provide a professional precision when cooking with them. The bottom of the pan is made with heavy-gauge hard-anodized aluminum to provide correct heating throughout the food. For flipping and rolling Omelettes, the slanted sides provide an easy slide method that prevents tearing and ripping off the food. Over time, these pans will be well-seasoned and will provide delicious flavors to your Omelettes. There is a special texture to these pans that allow for the perfect browning of your golden Omelettes. These pans can be used for cooking other foods, such as fish and vegetables, and it will not risk damaging the pan. Is double coated for a non-stick surface made to last? This set comes with one 8” pan and one 10” pan. The stainless-steel handles will stay cool no matter how hot the pan gets. Sloped sides allow for easy tossing, flipping, and rolling. Continues to be seasoned as it is used. Can be placed in the dishwasher. Oven safe up to 500̊F. These pans should not be used with metal utensils. These pans are not compatible with induction ranges. Takes time to break in the product. The coating can peel after a few months due to wear and dishwashing. The outside of the pan can acquire ‘burn’ marks. These pans are two-piece set one 10” pan and one 12” pan. They are made of heavy-gauge aluminum that allows for even heating and cooking. The pans have a triple layer of non-stick coating; two provide that the coating is long-lasting while the third coat allows for performance. They have brushed stainless-steel handles that stay cool for easy handling on the stove top; however, these pans are oven safe as well, though the handles will get hot. The bottoms of the pan are deep and wide, while the sides slope for easy rolling, turning, and tossing. With the non-stick layers, you will be able to cook with less fat and oils that allow for an easier cleanup. These pans actual cooking area are 8” for the 10” pan and 9.5” for the 12” pan. 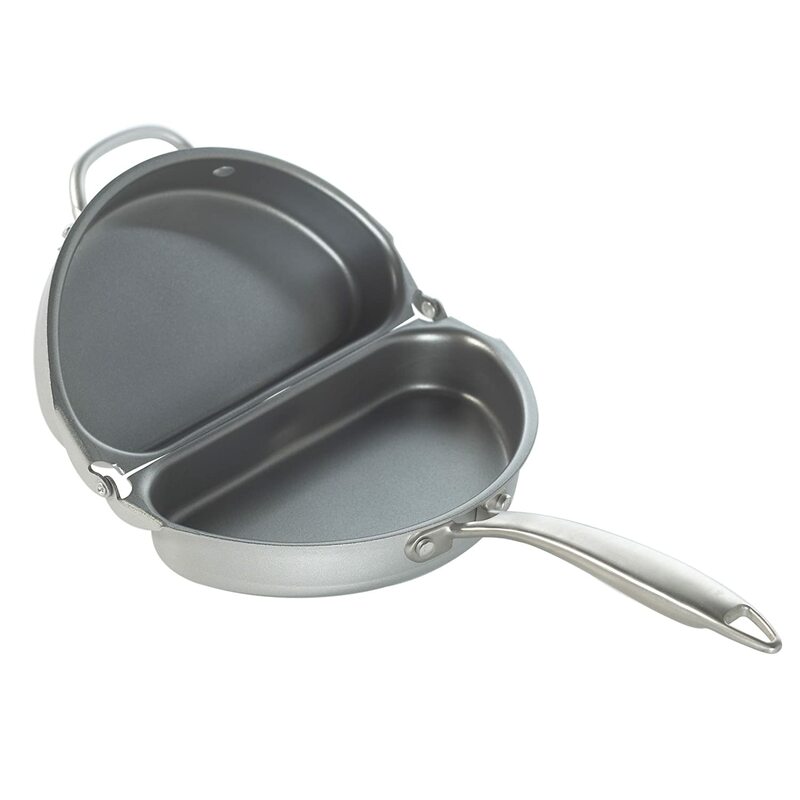 Since these pans are made with aluminum, they are non-ferrous and have no iron content. These pans weigh about 2.5 lbs. Each, making for lightweight easy to handle pans. These pans come with a lifetime guarantee. Easy to clean and season. Can be used continuously for years. Can use fewer fats and oils in your cooking. The non-stick coating only last about 1 year and is not covered by the warranty. The diameter of the actual cooking area is less than the size of the pan. The coating can scratch off. Retains a burned look to the inside cooking area of the pans. Nordic Ware Italian Frittata and Omelet Panis a hinged pan that allows for easy flipping of Omelets. This pan is easy to clean, simple to use and has a compact design for easy storage. This is a stainless-steel pan with a non-stick coating. It is about an 8.4-inch pan that has a depth of 2-inches. It can make Omelets on the stovetop or in the oven. It distributes heat evenly and allows for even cooking. 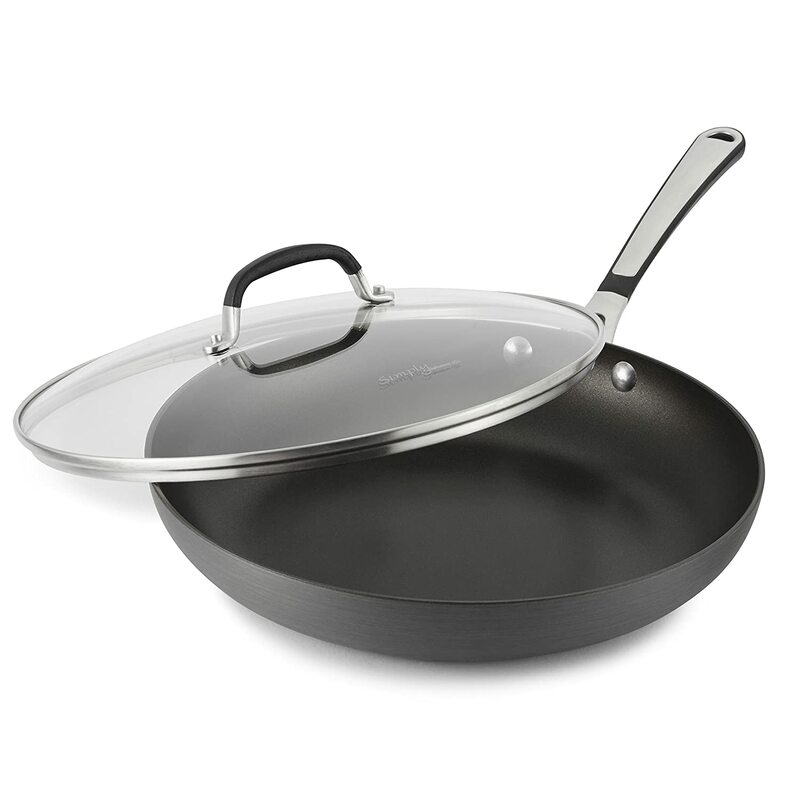 This pan is very light in weight, weighing only about 8 ounces. 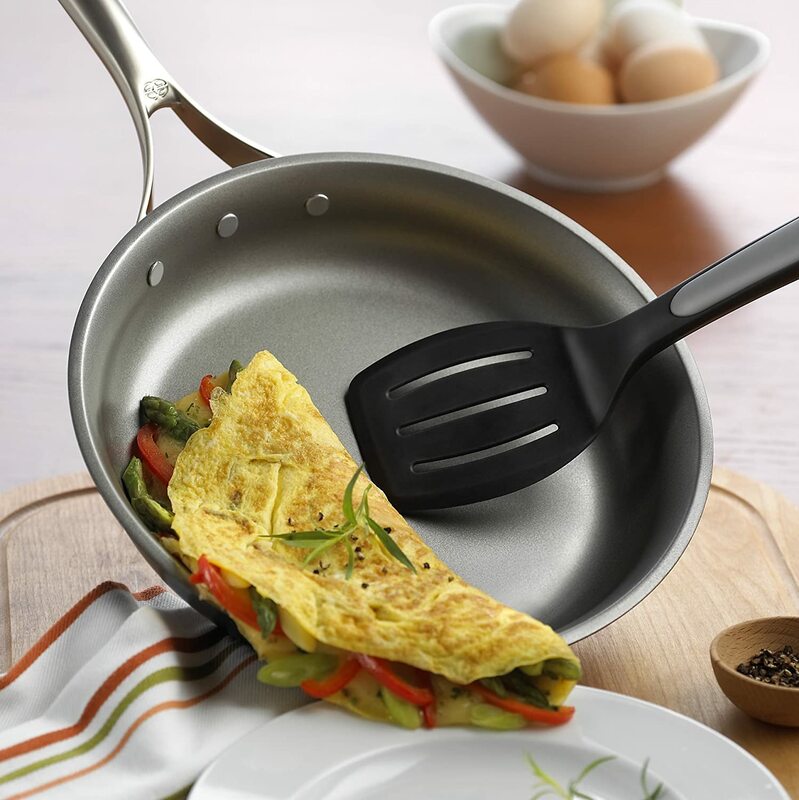 It’s two handled design makes it easy to flip your Omelet without getting it everywhere outside of the pan. The handles do get very hot, so you’ll need to use an oven mitt or pot holder. Hinged design allows for easy flipping and filling of Omelets. Easily stored with the compact design. Two handles allow for easier use. Even heating and cooking of food. Can be used on any stove top. This pan is oven safe. Hinges are durable and long-lasting. Need to use cooking oils or butter to help food not to stick. Better for big Omelets, rather than single-serve Omelets. 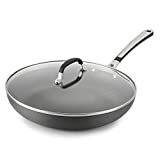 Simply Calphalon 12-Inch Nonstick Omelet Fry Pan with Lid is a 12” pan that is made with high-quality hard-anodized aluminum with non-stick coating. This pan allows for even cooking and heating of food. The interior is double-coated for durability and long-lasting use. This pan comes with a lid that is made from tempered glass. It can handle up to 400̊ F in the oven. The handles are designed to stay cool on the stove top and are made with stainless-steel and silicone. This pan should be hand washed, not used with steel utensils and is not recommended for induction stove tops. This pan weighs about 4.6 lbs. Which can be on the heavier side for Omelet pans, but is durable and long-lasting. The actual cooking surface is about 9.5-inches due to the sloping sides. The depth is about 2” deep, making for a thicker and fluffier Omelet. Aluminum allows for an even cooking surface. This pan comes with a lid. Has a double-coating of non-stick. It is a bit more expensive than other pans. The non-stick coating can wear in patches. Should not be used in the dishwasher. This pan is a bit on the heavier side. Poor warranty coverage and replacement. T-fal A857S2 Specialty Nonstick Omelet Pan 8-Inch and 10-Inch Dishwasher Safe PFOA Free Fry Pan / Saute Pan Cookware Set, 2-Piece, Gray is a set of two pans that are both non-stick and have ergonomic comfort grips on the handles. These pans are durable and long-lasting, great for everyday use. These pans are made with aluminum which cooks evenly, allowing for food to be heated correctly and thoroughly. These pans are easy to clean and can be placed in the dishwasher. These are very lightweight pans, only weighing about 1 lb. each. 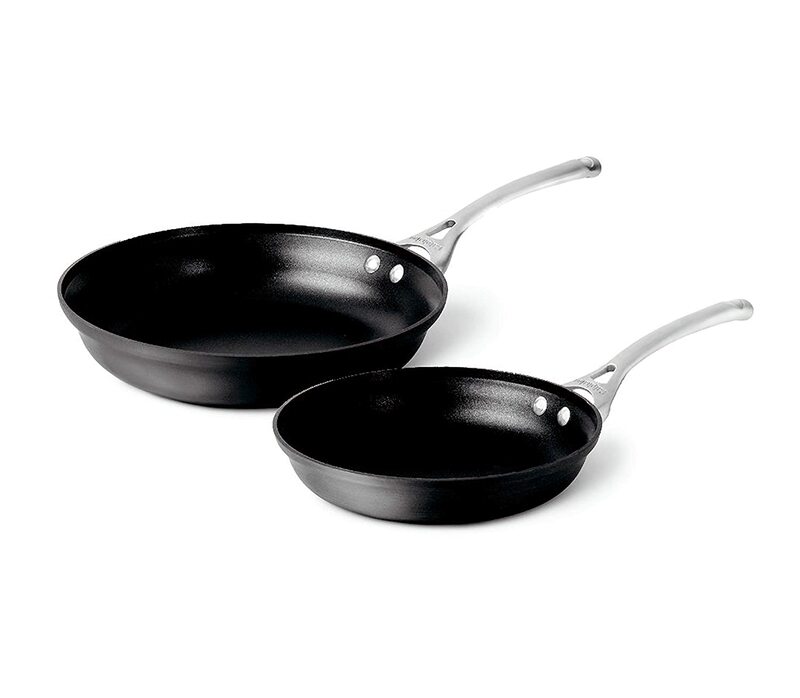 These pans are PFOA free and are safe to use for cooking as they also contain no iron. However, these pans will not work on an induction stove top. With the non-stick coating on these pans, you can rest assured that you can use fewer fats and oils to cook healthier foods. These pans can also be used to cook other foods such as vegetables and meat. These pans have a durable and long-lasting non-stick coating. The aluminum material allows for even cooking. These pans cannot be used in an oven over 500̊ F.
Cannot be used on an induction cooktop. The handles gradually loosen from use. The cooking area is less than the actual size of the pan. When looking for the products you need in your kitchen, maybe you need an Omelet pan. I didn’t think I did, and now I have eight that I just can’t live without. Maybe you don’t need eight. Maybe you just need two Omelet pans, because you should have more than one size. 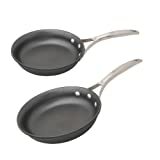 I recommend you going with the T-fal A857S2 Specialty Nonstick Omelet Pan 8-Inch and 10-Inch Dishwasher Safe PFOA Free Fry Pan / Saute Pan Cookware Set, 2-Piece, Gray because of the great quality these pans are. They are made from high-quality aluminum that allows you to cook your Omelet evenly, even with all the fillings you cram into it. It also offers comfort grips, so if you find that your wrists are hurting from chopping, typing, or writing, cooking won’t hurt you. You can put these pans into the dishwasher for easy cleanup, and not have to worry about hand washing and drying your pans. While I don’t do it with my pans, you certainly can use these pans to cook other delicious foods as well. However, you should know that by using them for other things, the coating may wear off quicker than with just making Omelets.